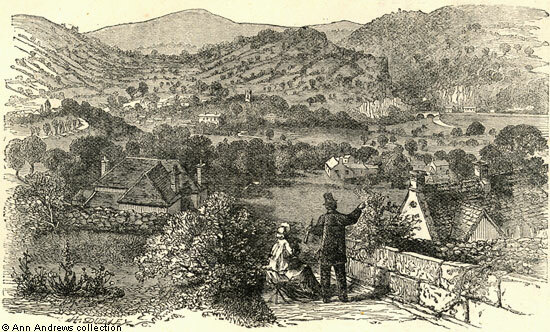 Engraving by H. Dudley, used as the frontispiece in "Practical Hydropathy"
"SMEDLEY'S INSTITUTION, as situated in Matlock, is in the centre of England, in the midst of a district renowned for its varied and beautiful scenery, and stands on the south-western slope of a range of sandstone hills, at an altitude which secures a pure, dry, and bracing atmosphere. It is remote from the great centres of population, with their contaminations, yet is easy of access, and is surrounded by numerous objects of interest, alike from the natural, artistic, and antiquarian point of view". "Practical Hydropathy", which John Smedley produced in several editions, describes the treatments the hydro offered and includes several engravings of the local scenery. These are randomly scattered throughout the book and the page they are on tells us nothing about the images other than their title. This image shows High Tor and Masson, the railway bridge over the river near the Boat House Hotel and the church with Knowleston Place below it. There were settlements in Matlock Town and Matlock Green, but both the Bank and Matlock Bridge were hardly developed at this time. Image scan and information researched by © Ann Andrews.